When the ConfigMgr Admin Console version 2012 SP2 (or 2012 R2 SP1) is installed and the ConfigMgr client is not updated on the same computer you could see an error like the one below. The program can’t start because mfc12u.dll is missing from your computer. Try reinstalling the program to fix this problem. StatView.exe requires Microsoft Visual C++ and ConfigMgr 2012 SP2 now uses VC++ 2013 which is not installed as part of the Console. 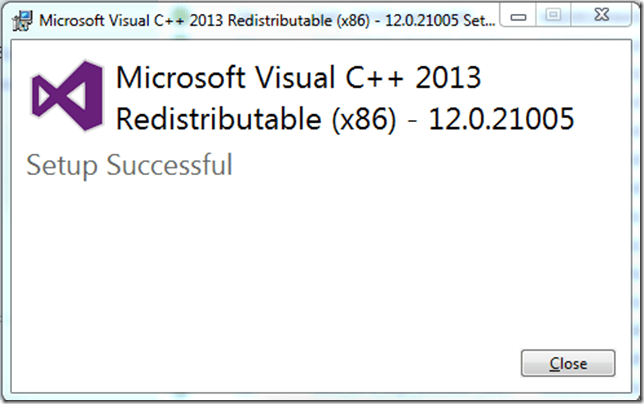 To resolve the issue, install Microsoft Visual C++ 2013 Redistributable (x86) which can be found at \client\i386\vcredist_x86.exe">\client\i386\vcredist_x86.exe">\\PrimarySiteServer\SMS_<SiteCode>\client\i386\vcredist_x86.exe. Notice that the x86 version is required even if you are running Windows x64. This is because StatView is a 32-bit application. This will install and register mfc12u.dll and other files which should resolve the issue. You can verify the installation in Programs and Features (Add/Remove Programs) as shown below. What’s my ConfigMgr version: 2012 SP2 or 2012 R2 SP1? 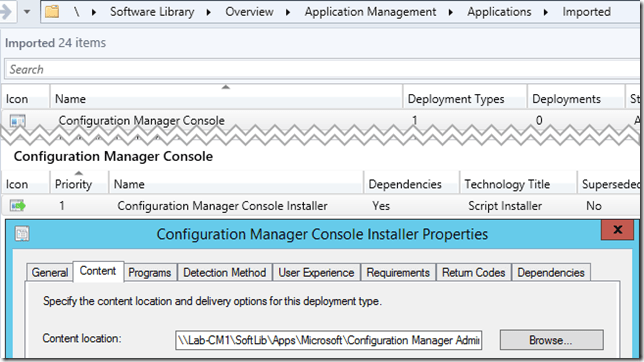 Launch the Configuration Manger Admin Console and check the about screen. The console version will be 5.0.8239.1000 and the site version 5.00.8239.1000 for both SP2 / R2 SP1; however the product name will show “System Center 2012 R2 Configuration Manager SP1” or “System Center 2012 Configuration Manager SP2” to indicate the difference. Review the 2012 R2 release notes (What’s New in System Center 2012 R2 Configuration Manager) and note the new features. If these exist within the Admin Console on the connected site, then R2 is installed. Probably the easiest check is in Software Library –> Operating Systems –> Virtual Hard Disks. The VHD feature set is part of R2 and won’t exist in a non-R2 site. Where can the R2 installer be download from? If installing ConfigMgr 2012 SP2 / 2012 R2 SP1 from evaluation media, you’ll easily notice that there are 2 files to download and install. The small (1.1 mb) file is the “R2” installer / enabler. Otherwise the code base is identical between the versions / editions. If installing from MVL media, the small “R2” installer may not exist for download. I’ve only see 1 company’s MVL site and the file didn’t exist in any place we could think to look. 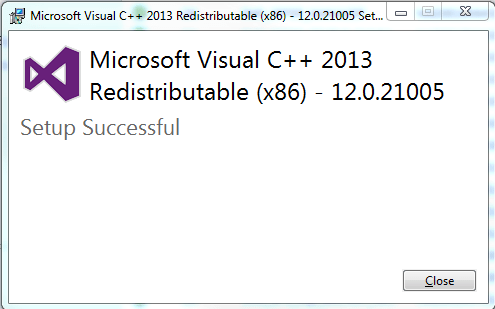 Installing “R2” from the evaluation file, SC2012_R2_SP1_ConfigMgr.exe, worked fine on multiple MVL installed sites. When I installed R2, there were almost no indications of the change. The Windows Application Event Log did show that “Product Name: Microsoft System Center Configuration manager. Product Version : 5.00.8239.1000 … Reconfiguration” succeeded, but notice that the name does not identify SP2 or R2 SP1. Failed to download files through BITS. Error: 0x80200013, Description The server does not support the necessary HTTP protocol. Background Intelligent Transfer Service (BITS) requires that the server support the Range protocol header. I discovered that Microsoft KB922330 describes the issues and a workaround. -The proxy server environment does not support the HTTP 1.1 range request feature. -You are behind a SonicWALL firewall device, and the Enable HTTP Byte-Range request with Gateway AV setting is not enabled for the device. When you copy a file by using BITS in background mode, the file is copied in multiple small parts. To perform this kind of copy operation, BITS uses the HTTP 1.1 Content-Range header. If you are behind a proxy server or behind a firewall that removes this header, the file copy operation is unsuccessful. Note When BITS copies files in foreground mode, BITS does not use this header. 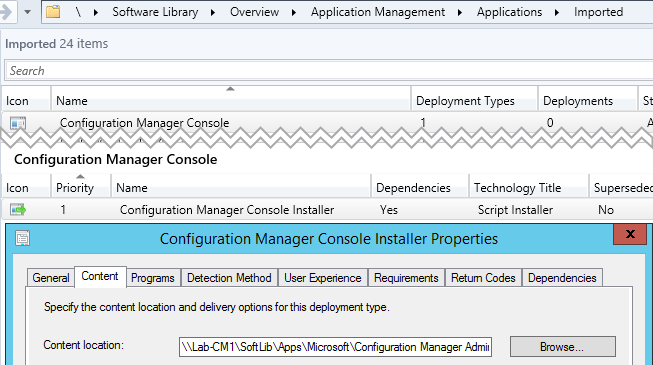 Interesting… changing the BITS priority will work around the issue and it just so happens that we can control that in the ConfigMgr client installation. Running ccmsetup.exe /BITSPriority:FOREGROUND did work around the BITS error during client installation. The client successfully installed and registered with the Primary site. We could also manually copy all of the installer binary files locally and use the /SOURCE parameter as another alternative. Success!… well, not so fast. From an ongoing operations perspective not much was gained. Although Client Settings allow controlling BITS throttling, it cannot control BITS priority. 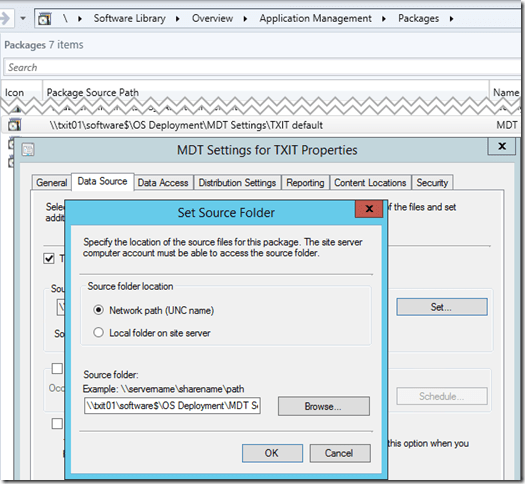 About a year ago the question about controlling BITS priority from a ConfigMgr content distribution perspective was asked on the TechNet forums and the product team did confirm that it isn’t a current feature. It looks like the firewall or proxy server will have to be kicked in the shins after all. I stumbled on to an interesting post by the 2PintSoftware guys whom have been doing A LOT of great work with BITS and BranchCache recently. If I set the BITS Throttling Rate in SCCM, does it apply to all downloads? Oh no. That would be too simple. 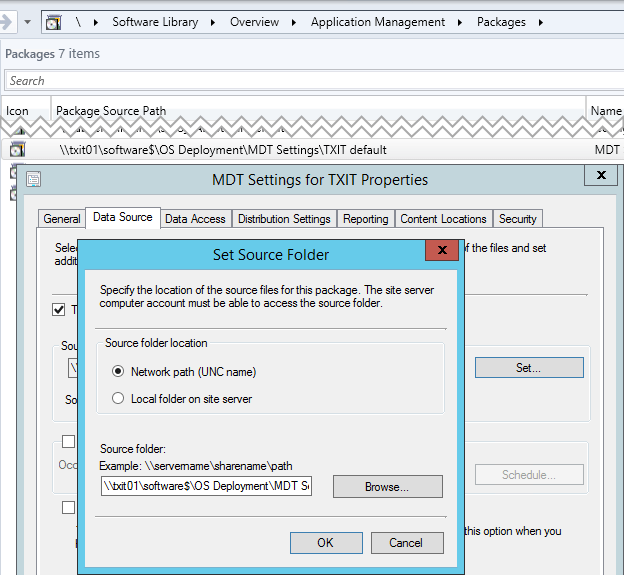 Remember that the client setting in SCCM is for Background transfers only. So if you make a deployment ‘Available’ as opposed to ‘Required’, then it will be a BITS Foreground transfer that is created and it will attempt to use whatever bandwidth it can get it’s grubby little hands on. So it appears that ConfigMgr does know about BITS priorities beyond the ccmsetup.exe scope, but you still can’t change it. Yesterday I upgraded my ConfigMgr 2012 R2 lab to SP1 and encountered a small bit of trouble. During the SP installation the Admin Console failed to uninstall; during installation the MSI performed an unexpected reboot. The primary site server had recently been upgraded to CU5 for ConfigMgr 2012 R2 but had several reboots since. As far as I can remember the Admin Console was not running when the service pack installation began, nor any time during the installation. The Admin Console failed to uninstall during the service pack installation. After the service pack installation, a manual reboot was performed. The Admin Console was reinstalled via command line. The MSI return code of 1641 was generated and MSI automatically rebooted the server. Below are some details captured from the installation logs. INFO: AdminConsole will be deinstalled first for upgrade – "E:\Program Files\Microsoft Configuration Manager\bin\I386\ConsoleSetup.exe"/uninstall /q. WARNING: Configuration Manager console installation failed. ConfigMgrAdminUI.log has further information. 5/14/2015 2:46:55 PM MSI: Another application has exclusive access to the file ‘E:\Program Files\Microsoft Configuration Manager\AdminConsole\AdminUILog\CMSitePSProvider.log’. Please shut down all other applications, then click Retry. The Admin Console installation was initiated via command line from an elevated PowerShell ISE session. 5/14/2015 3:28:56 PM MSI: You must restart your system for the configuration changes made to System Center Configuration Manager Console to take effect. Click Yes to restart now or No if you plan to manually restart later. 5/14/2015 3:28:56 PM Installation succeeded. Windows Installer has initiated a reboot. *Notice that the time difference in the 2 log lines in <=1 second. Also, no visible prompt was generated asking about a reboot. MSI (s) (78:04) [15:28:56:261]: Windows Installer installed the product. Product Name: System Center Configuration Manager Console. Product Version: 5.00.8239.1000. Product Language: 1033. Manufacturer: Microsoft Corporation. Installation success or error status: 0. MSI (s) (78:04) [15:28:56:261]: Windows Installer requires a system restart. Product Name: System Center Configuration Manager Console. Product Version: 5.00.8239.1000. Product Language: 1033. Manufacturer: Microsoft Corporation. Type of System Restart: 1. Reason for Restart: 1. MSI (s) (78:98) [15:28:56:261]: RESTART MANAGER: Session closed. Hopefully no one else runs into this scenario.